To protect the health and safety of people and wildlife, members of the general public should not handle wildlife. Wild animals can inflict serious injury, and they can be carriers of disease and parasites that are transmittable to humans and domestic animals. If you find a sick or injured animal, either leave the animal where you found it and let nature take its course, or call a wildlife rehabilitator for advice on how to proceed. Call the local animal control office or police department for assistance if the animal poses a threat to public health or safety. It is illegal to care for sick, injured, or orphaned wildlife in Illinois unless you have a permit from the Illinois Department of Natural Resources. Individuals with wildlife rehabilitator permits may assist injured wildlife if necessary. Wildlife rehabilitators should not be expected to have the resources (finances and facility) or experience to successfully treat all species of Illinois wildlife. You should not attempt to assist an animal if there is a risk to personal safety or to the safety of others. If you find a sick or injured animal, there may be a wildlife rehabilitator in your area able to assist you. Untrained individuals should not handle sick or injured wildlife. If rabies is suspected, call the local animal control agency so that the animal can be captured and tested. If you have been bitten by a wild animal, seek medical attention immediately. Your health care provider can assess your risk for rabies exposure and can administer postexposure prophylaxis (PEP) if needed. You can contact the Illinois Department of Natural Resources wildlife biologist assigned to your county if you encounter a sick or injured deer. However, these biologists do not have the ability to use tranquilizers to immobilize deer so that the deer can be removed from an area and treated. Additionally, few Illinois wildlife rehabilitators have a permit or the facility and equipment necessary to successfully treat adult white-tailed deer. However, deer can survive and recover from fairly severe collisions with vehicles. Broken and fractured bones will heal with time. Call the local police department (non-emergency number) if a deer has been severely injured in a vehicle collision. Be aware that the police department may not respond if the deer is still capable of walking. Additionally, police officers may be prohibited from going onto private property due to liability concerns. Since deer are large, powerful animals it is usually safer and kinder to humanely kill a severely injured deer than to expose it to the additional stress of capture, restraint and treatment. Many times fatal internal bleeding and organ damage is not apparent while the deer is alive. Never chase an injured deer. Chasing an injured deer without a way to chemically immobilize and/or restrain the animal only endangers the deer and the public. The local public works or roads department handles the removal of deer carcasses along roadways. Birds of prey (hawks, falcons, eagles, and owls) and large wading birds (herons and egrets) should not be handled by the public, because they can cause serious injury. Call a wildlife rehabilitator for assistance if you find a sick or injured bird. If you find multiple dead birds in one location, call the IDNR wildlife biologist assigned to your county. When people come in contact with young wildlife, they may jump to the conclusion that the animal is orphaned and in need of assistance. However, most often this is not the case. Many "orphaned" animals that are "rescued" each year by well-meaning individuals are not orphans. Young animals are often left alone while their parents are away searching for food. Do not touch or remove the young animal unless you are absolutely sure that it is an orphan or severely injured. If you are not sure if the animal is orphaned, watch it from a distance so that the parents will not be afraid to return. Many species return to their young near dusk and dawn. A young animal that looks well-fed with bright eyes and clean fur or feathers is probably not orphaned. If the animal does need help, contact a wildlife rehabilitator for advice. Young deer are called fawns. Fawns are often found alone, because they do not flee from danger until about 14 days of age, and they do not forage with their mother until they are older. To escape detection a fawn lies motionless in tall grass or other cover. Its spotted coat helps it blend into its surroundings by imitating dappled sun on vegetation. A fawn's lack of scent also helps to protect it from detection by predators. 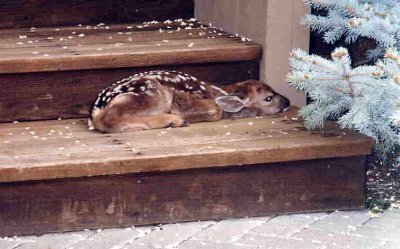 Sometimes fawns end up in strange places, such as in window wells or on sunny porch steps. If you find a fawn by itself do not move it unless it is in harm's way. If the fawn must be moved, try to find cover nearby so that the doe can find the fawn when she returns to nurse it. Does typically nurse their fawns at dawn and dusk. Does in suburban areas are familiar with human smells, and they will not abandon a fawn that has been touched by a human. The condition of an orphaned fawn will deteriorate quickly if it is not nursing. If you are sure that the fawn is orphaned, or if it is injured, call a wildlife rehabilitator. Fawns require special care. Do not feed the fawn or attempt to care for it yourself. It is illegal to keep a fawn unless you have a permit. Taking a fawn from its natural habitat and teaching it to associate food with humans is doing the fawn a disservice. Once the fawn matures, it will be too large to stay in a house or garage. These deer are often released in a natural area once they are grown, but they are likely to suffer an early death. Human habituated deer may also pose a danger to pets and people, especially during deer mating season. Rabbits nest in shallow depressions on the ground. 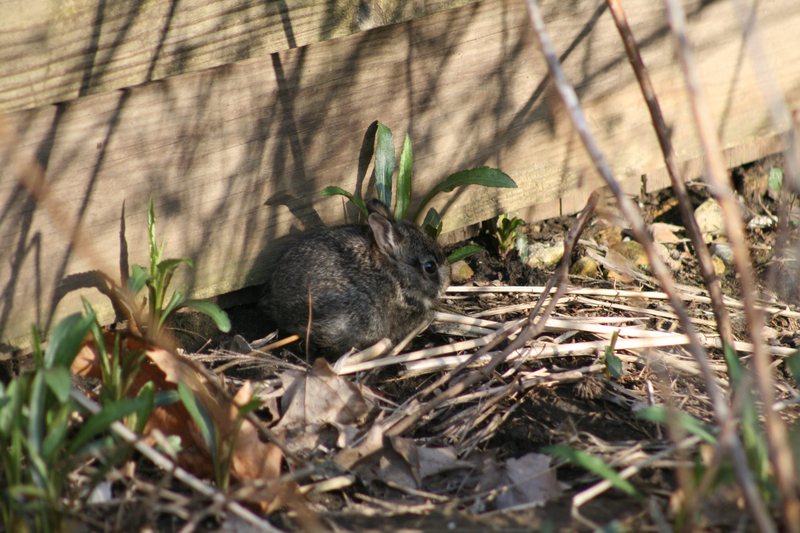 It is not uncommon to find a rabbit's nest in the middle of a lawn or garden. Since the mother only returns at dusk and dawn to feed the young, you will probably not see her visiting the nest. If you find a rabbit's nest, leave it alone. Keep cats and dogs away from the area. If young rabbits are in the nest, they should be left alone. Rabbits are weaned at around three weeks of age. Although they may appear to be too young to be on their own, young rabbits that are hopping around outside the nest do not need your assistance. If you find baby rabbits that are weak or injured, contact a wildlife rehabilitator. Do not attempt the feed the rabbits. People often find young birds out of the nest during the spring and summer months. When deciding if a baby bird needs assistance, it is helpful to know whether the bird is a nestling or a fledgling. Nestlings are small, rapidly growing birds that are not fully feathered. Nestlings found on the ground are vulnerable to the elements and to predators. If you can find the nest that the bird fell from, you can try and put the bird back in the nest. If the nestling is cold and wet, or was injured in the fall, call a wildlife rehabilitator for advice. Do not attempt to feed the young bird. Fledglings are fully feathered but are not yet able to fly well. These young birds are often seen on or near the ground calling loudly for their parents to bring them food, hopping around on the ground, or making short, awkward flights. 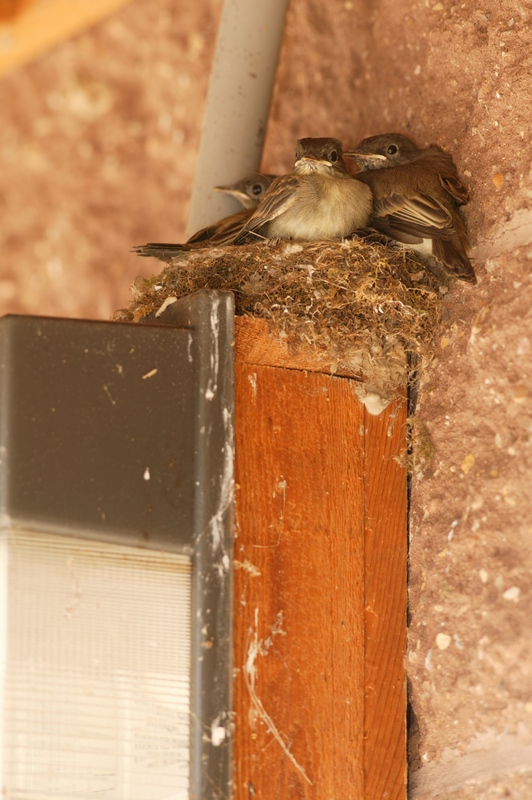 The parents will care for fledglings until they are able to fly well and can feed themselves. Parents will be nervous to bring food to their young if they think a predator is nearby, so watch fledglings from a distance. Keep cats and dogs away from the area until the young bird is able to fly well. Fledglings do not need your assistance unless they are injured. Fledglings sometimes break legs, feet, or wings on their first flight out of the nest. 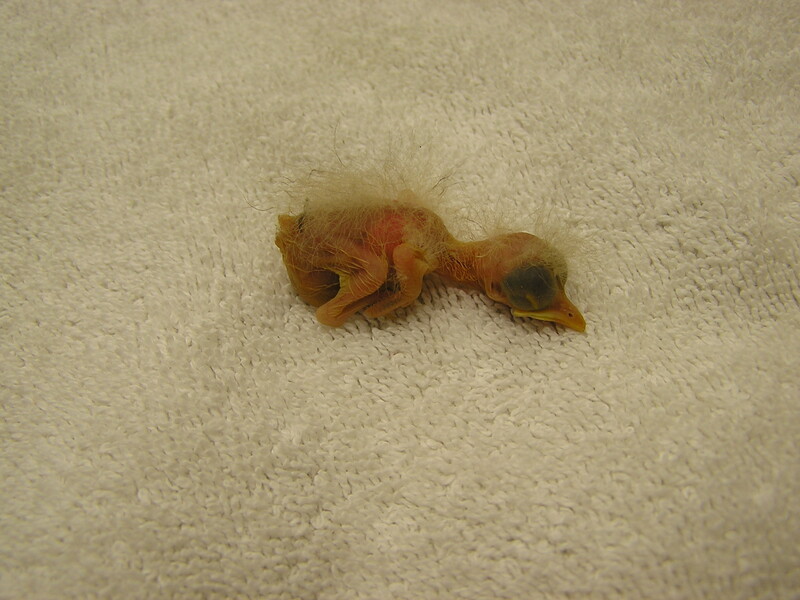 Contact a wildlife rehabilitator for advice if you find an injured fledgling. Do not attempt to feed the young bird. Note: Waterfowl (ducks, geese, or swans) do not leave their young alone. Call a wildlife rehabilitator for advice if you find young waterfowl alone with no adults nearby.